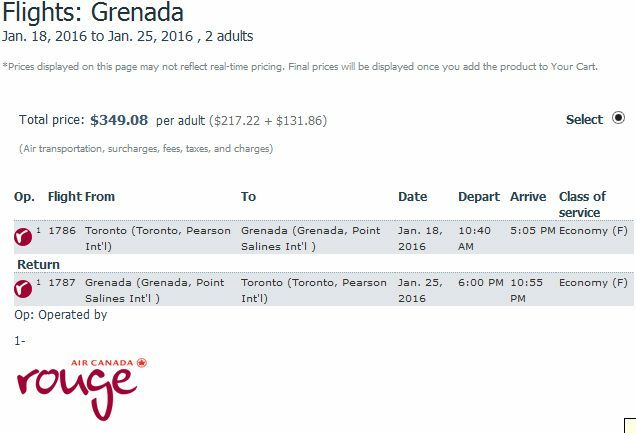 Air Canada Rouge has dropped the price of their last minute flights from Toronto to yet another Caribbean island. This time it's to Grenada, which is about as far south in the Caribbean as you can get. It's even further south than Barbados. Note: The AirCanadaVacations flight search tool searches for 2 passengers by default. A lot of people mistakenly think the price has doubled when they get to the checkout cart. It's the price of 2 flights. Where to stay in Grenada ? The following AirBNB links will lead you to some great deals on places to stay in Grenada for under $99 CAD/night for 2 people. AirBNB is showing around 30 listings for under $99/night for these last minutes dates. You could also try VRBO, which is showing 7 properties for under $80 USD/night around these dates. Just run a search for Grenada when you get there. After you hit Search you can apply the price filter. toronto, yyz, caribbean, flight deals, southern caribbean, grenada, air canada rouge, windward islands and lesser antilles.